I can't describe how Barcelona managed to win in tonight's match, it was an impossible mission in which they succeeded. Seems like they caught the Valencia players tired, but Barcelona players kept on running and running like they are on some kind of performance drugs. The goal that Barca scored was ultimately a lucky thing, as in Messi somehow forwarded right towards the ball and even after Guaita's fast reflection the ball still went in. Before the match it was like a friendly with all the players hugging and greeting each other and there seemed to be an great atmosphere, but when the match started in was a fierce competition. Valencia were pretty much in control and were very fluent in their movement and passing creating few dangerous runs towards Barca goal. Perhaps what was giving Valencia power early was the fact that Unai Emery started with 5 midfielders and had Mathieu(LB) play as a winger, essentially fielding 6 midfielders in order to gain control of the midfield. The link here was Ever Banega as his ball holding and controlling skills are superb and also his dead ball control is outstanding allowing him to block off any pressuring Barcelona players and make a pass. This controlling and attacking momentum of Valencia will come to an end though in the 12th minute and from then on Barcelona will gradually improve their control, passing and attack. There were generally quite a bit of chances on both sides overall in the whole 45 minutes in the first half and Valencia even had a legitimate goal ruled offside. Alba got a through ball, sprinted forward, dribbled past Pinto and scored and the linesman raised the flag and it was rulled offside, although from the replays you can see Alba was perfectly in line with the Barca defense and this should have been a goal. (please implement camera technology in the games UEFA and Fifa). Anyways Dealbert made a stupid mistake like against Malaga I believe when he just fell and allowed Messi to sprint forward alone on goal, but miraculously missed by attempting to lob Guaita. Barcelona had few chances other than the Messi one and Villa actually set two of them up, one to Messi which he also missed and one to Alves. Anyways the first half ended with both teams deserving a goal, thoug if we look at it realistically I would say Valencia should have been 1 up and the goal should not have been ruled offside. In the second half Soldado was brought on for Joaquin and even though Barca was having most of the possession Valencia had the first dangerous chance which involved Soldado, but he could only shoot wide. Pablo also had a great chance which he must have either scored or assisted Soldado and Valencia should have scored a goal then also. Barcelona was having chances also and Villa, Messi, Adriano all had their chances, but they all missed, though Villa seemed like he was intentionally choosing the worst option as if he didn't want to score a goal, which is quite understandable actually. Barcelona goal was the luckiest thing I've ever seen, even though Adriano managed to outrun Stankevicious the pass was heading nowhere particualrry, but somehow Messi as usual found himself sprinting towards the ball and shot, Guaita made a good reflex save, but still couldn't quite keep the ball out of the net. After the goal Emery brought Jonas who was moving very well, Valencia pressed really hard and tried to make something happen in the last 10 minutes, much like they won most of their matches in the last 3 months, but they just couldn't do it. It was a fun match and full of excitement, but unfortunately Valencia lost, even though they deserved a draw and fought really hard and often even managed to beat Barcelona at their own game in posession football. Every Valencia fan can be pleased after the match though as the players showed real character, fighting spirit and quality(except two). Hopefully with a stronger defense next season Valencia can mount even a challenge to Barcelona for the league title. As for this season Villarreal won their match and once again come closer to Valencias 3rd position with just one point less, but Villarreal are yet to play against Barcelona and the other tough matches are quite equal in that they need to play against Atletico which Valencia beat. 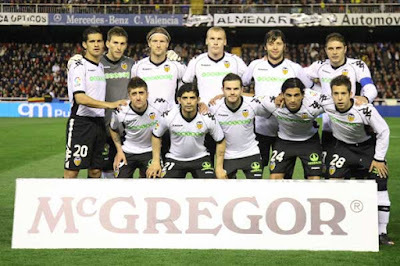 Valencia CF (0): Guaita; Stankevicius, R. Costa, Dealbert, Alba; T. Costa (Isco, min. 83), Ever, Joaquín (Soldado, min. 45), Pablo, Mathieu (Jonas, min. 80); Mata. FC Barcelona (1): Pinto; Diego Alvés, Piqué, Abidal, Adriano (Maxwell, min. 81); Mascherano (Pedro, min. 64), Xavi. Busquets; Iniesta (Keita, min. 87), Messi y Villa. Goals: 79 min, 0-1 Messi. Guaita 8 - Had 3 amazing blocks, two of which were sucesful, but the Messi shot for the goal somehow went in. Guaita has proven this season he is a top class goalkeeper. Stankevicious 6.5 - Had an amazing match until that fatal minute when he was outrun by Adriano and the goal was scored, but I can't take it from him that he played really well otherwise. R. Costa 7 - Great match for Costa, managed to tackle, mark and pass greatly and most of the time won his duels. Dealbert 3 - The weak link in the defense. Made a huge mistake by giving the ball away to Messi and maybe could have done better to stop Messi shot that lead to the goal, had few good tackles and won headers though, but he was defenately the weak link in defense. Alba 7.5 - Superb in defense and great in attack. Had a great understanding with Mathieu and offered a lot in this match. Joaquin 5.5 - The worst of the player on the field, could not support the passing game and didn't return back enough and was rightfully substituted. Banega 7 - Very confident display from the midfielder, great and accurate passing, covered his zone good and was the main player for Valencia to have any posession. Tino Costa 6 - Run tirelessly all match, gave it his 110% percent, but could not muster up the pass or shot to do something. Needs to work on his guard with the ball. Mathieu 6.5 - Good in defense and often very useful, less effective in attack and was overshadowed by Alba in this match, but still had a great match. Pablo 6.5 - The most creative player in the field, made few great passes, missed from a great chance, but overall a really fine display from Pablo. Mata 5 - One would expect our "best" and most expensive player to be a leader in this kind of matches and be the best performer but he failed flat in his task. Not dangerous as an attacker and later ineffective as winger also, lost way too many balls and falls to the ground very fast and not even getting a foul in the process, need to build up his strength. Soldado 5 - Apart from one shot at goal, did not really do anything. Failed to run channels, dribble and didn't even come forward to receive the ball. Jonas 6 - Brought immediate danger after his arrival, he was moving well and his dribbling skills seem good, linked up well with several players, but did not have enough time to make a difference in the result. Isco N/A - Not enough time, though he did lost the ball half the time he touched it. Needs refinement if he is to play at the first team in the top tier league.